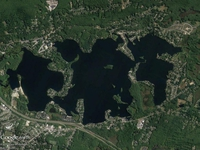 Unspectacular in appearance is Webster Lake at Webster, Massachusetts. But this name is not the right one, in fact it is called Lake Chaubunagungamaug. And that's already shortened, the full name is really unspeakable: Lake Chargoggagoggmanchauggagoggchaubunagungamaugg.